because I want this lunch bag and backpack. Really. I'm trying to figure out what I might need a lunch bag for, and I'm going to come up with something (to carry a diet coke around? I'll keep thinking.). 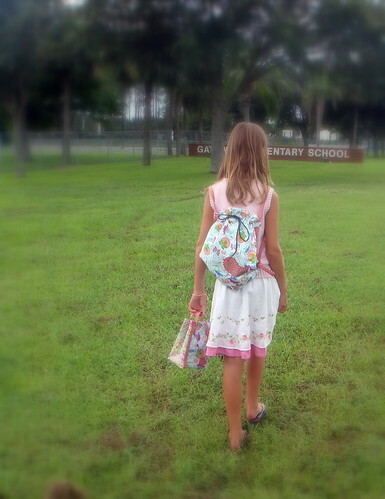 This began with the backpack, purchased for a beautiful little girl in Canada. 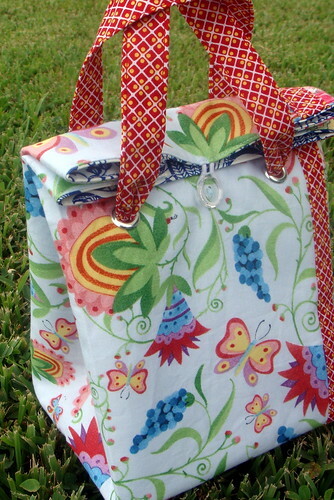 Her Mama, who has her own etsy shop, chose the blue floral and butterfly fabric and I chose the coordinating fabrics. The backpacks are completely reversible, this one having the yellow paisleyish fabric on the other side. The straps are completely adjustable and can be lengthened and shortened really easily. 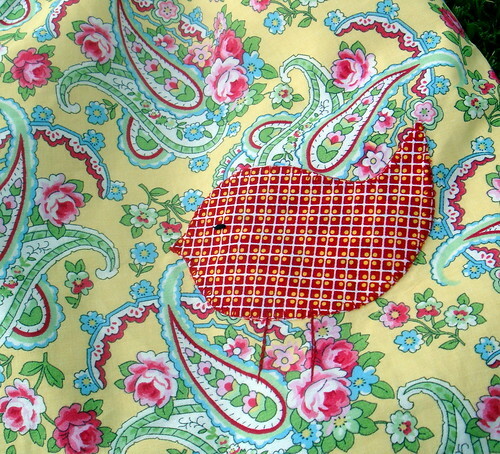 Both the blue and the yellow sides of the backpack have a red bird applique. 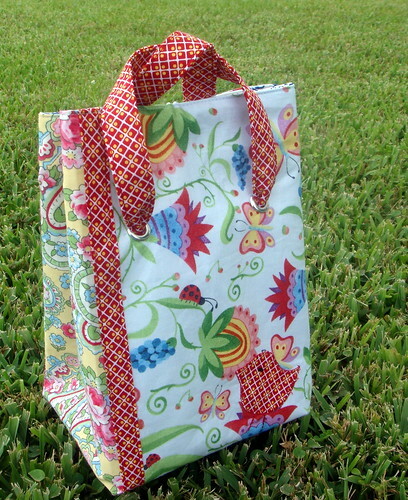 And then the idea for a lunch bag was brought up. I'm so glad it was! 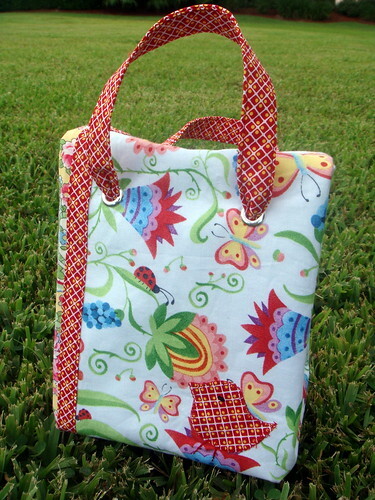 The bag coordinates with the backpack, even having a bird applique on the front. There are two buttons on the back of the bag so the top can either be closed when fully upright or with the top folded down about an inch. 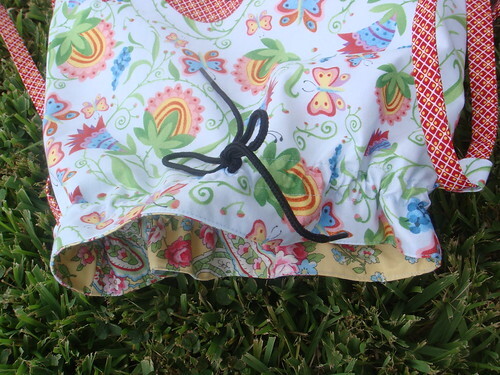 The straps are fed through eyelets and are set low enough to function with the top up or folded. The inside fabric is a waterproof vinyl. I hope the lovely young recipient enjoys this set as much as I do, and has as much with it as I did making it for her. 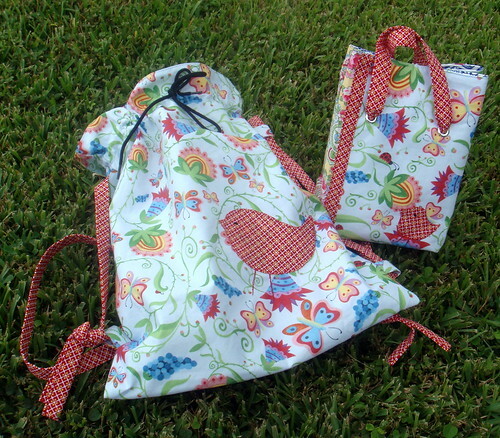 I'm considering adding some lunch bags to the shop, but would appreciate some feedback as to whether you think that'd be of interest and, if so, what you think someone would pay for them. Nice story with nice pic collection. This story is really inspirational for me. Oh how beautiful. I can't wait until my little girl is old enough for this stuff - The boys are only interested in skulls and fire! Gotta love them! That lunch bag is awesome! If I had a little girl, I would be buying it for sure! Great idea! Hmm; as for how much I would pay, not so sure either. $10-15 sounds WAY too little for something HANDMADE, but in this economy I probably couldn't buy it unless it was this price. If it coordinated with a backpack, maybe a little more? Gosh, I'm clueless.....because it's so cute, and you can make it fit the child by using any fabric, it's kinda priceless!! Goodness that is so, so sweet. I definitely think you should add lunch sacks to your repertoire. I can think of many adults who would love to carry them to work! she's going to be a hit with these! they're beautiful!! Love the backpack and lunch sack! 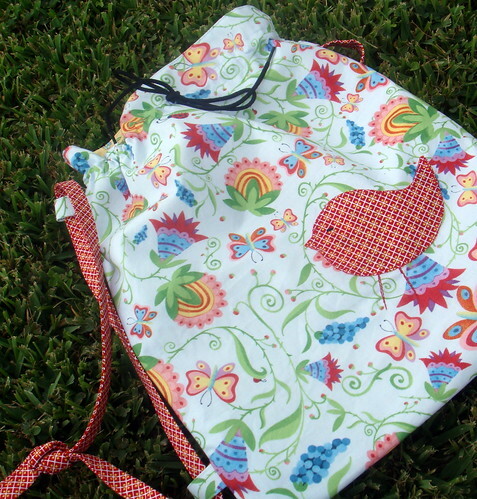 I have plans to make a drawstring backpack for my daughter to carry her webkinz in, so I am going to add a couple of pockets on the outside. Hopefully I can get to it this week! 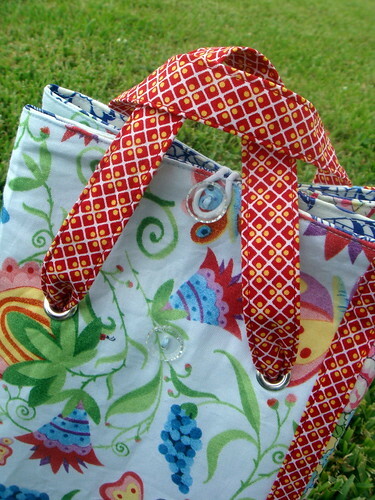 I love that sweet little set - and the fabrics are gorgeous! I say make up a few and test the waters on Etsy. 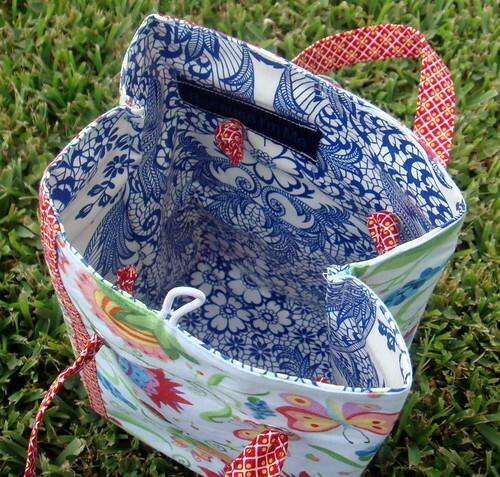 I'd list the lunch bags at around $20. They are absolutely gorgeous. I'm sure you would have plenty of customers for them.